From now on I will be presenting one item a week, perhaps more on some weeks, mainly to offer more variety in the content of the site, and also to bring more information to readers not so familiar with menswear and style. The black calf toe cap oxford is the most formal dress shoe there is and is best used with a formal suit. By "a formal suit" I mean something that isn't tweed or some other heavy or more casual fabric. Basically any grey and navy suit, plain or with pattern works. I personally prefer this shoe model over any other black shoe when wearing a suit in a formal business environment. The clean and elegant lines and the absence of brogue details just gives it that sleek and sharp look without screaming for attention making it the perfect choice for those occasions when you want people to listen to you (or someone else) instead of looking at your shoes. With more casual clothing, say, a pair of grey flannel trousers and an odd jacket, you will most likely be better off switching to more casual options. 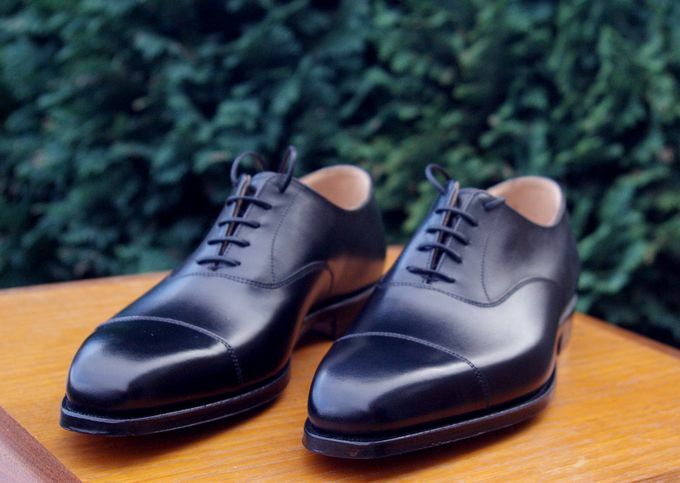 On the other hand, for a black tie event the black toe cap oxford should be replaced by a black patent leather shoe (boring) or a pair of black plaintoe oxfords or even a wholecut oxfords that are well polished. More on this later. I personally like a semi-squared and semi-aggressive last, such as the Crockett and Jones 348 last (meaning the Hallam model found from both pictures in this text) or the new Meermin Ben last. Other worthy manufacturers and lasts I especially like myself for a black toe cap oxford include Church's 119 last, Carmina's Simpson, Edward Green's 888, Vass' U-last or Sèptieme Largeur's 199 last. 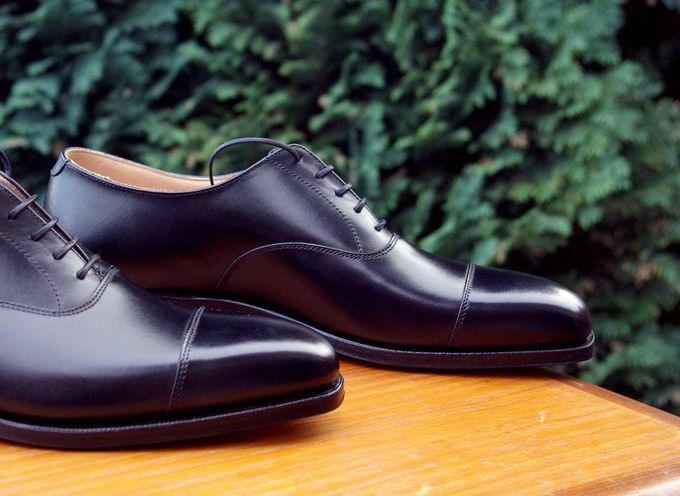 Being one of the corner stones of a man's wardrobe, I would strongly encourage one to invest into a high quality pair such as the C&J Hallam. Both pictures on this text are from an eBay seller carolj7275's eBay auctions.